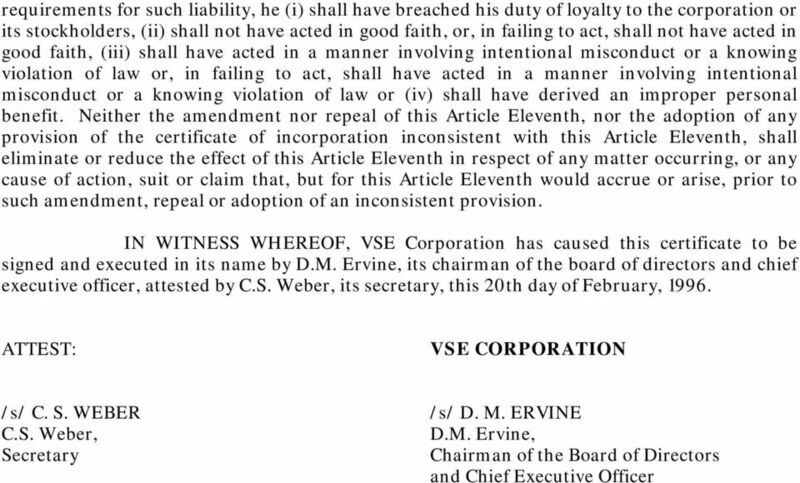 Download "CERTIFICATE OF AMENDMENT OF THE RESTATED CERTIFICATE OF INCORPORATION OF VSE CORPORATION"
2 AMENDED AND RESTATED CERTIFICATE OF INCORPORATION OF (Includes revised Article FOURTH as amended May 2, 2006) VSE Corporation (the "Corporation"), originally incorporated under the name Value Engineering Company, whose original Certificate of Incorporation was filed with the Secretary of State of Delaware on January 22, 1959, hereby restates its Certificate of Incorporation in its entirety and certifies that at a meeting of the Corporation's board of directors this Restated Certificate of Incorporation was declared advisable and duly adopted by the Corporation's directors in accordance with the provisions of Section 245 of the General Corporation Law of the State of Delaware. 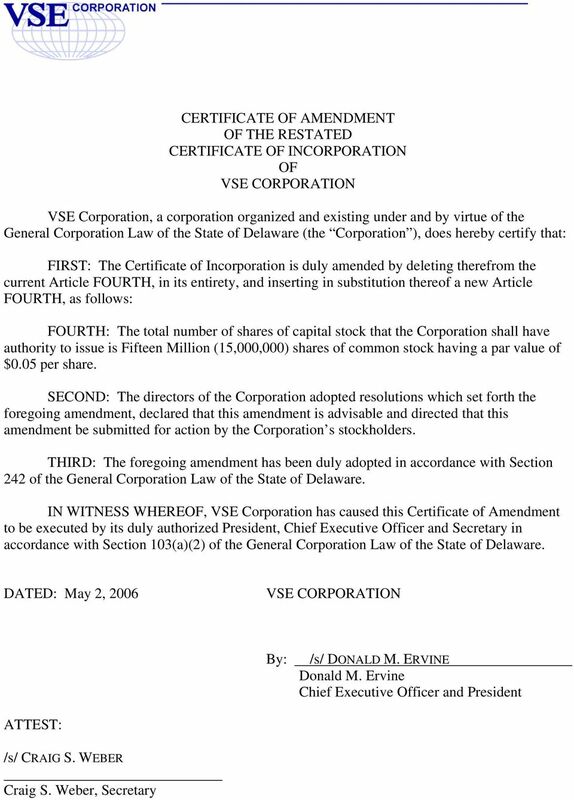 This Restated Certificate of Incorporation only restates and integrates and does not further amend the Corporation's Certificate of Incorporation as heretofore amended or supplemented and there is no discrepancy between those provisions as so amended or supplemented and the provisions of this Restated Certificate of Incorporation. FIRST. The name of the corporation is. SECOND. The registered office of the corporation within the State of Delaware is Three Christina Centre, 201 N. Walnut Street, City of Wilmington 19801, County of New Castle. The registered agent of the Corporation within the State of Delaware is The Company Corporation, Three Christina Centre, 201 N. Walnut Street, City of Wilmington 19801, County of New Castle, the business office of which is identical with the registered office of the Corporation. THIRD. The nature of the business, or objects or purposes to be transacted, promoted or carried on are: To carry on the business of research, experimentation, invention, discovery, testing, development, and utilization of processes and methods, or improvements thereto, in all the arts and sciences; including the conception, development, execution and completion of special scientific and development projects, on its own behalf and on behalf of any other person, firm, association, corporation, public or private, or the Government of the United States of America, or any foreign government, or any political subdivision thereof, or any governmental agency, and in this connection to operate testing stations as may be necessary or advisable. To construct, buy, sell, lease, license, maintain and operate laboratories and laboratory facilities of all kinds; to carry on and make tests, experiments, analyses and to do research work and to perform analytical, experimental and research services of all kinds whether of a scientific nature or otherwise, and to do any and all acts and transact any and all business which shall or may be or become incidental to or arise out of or be connected with such business, or any part thereof. To engage in and carry on the business of consultants; to construct, supervise the construction of, install, maintain, own, operate, lease, repair, service, and generally deal in and deal with electronic, electrical, electro-mechanical and mechanical apparatus, devices, systems, processes, machinery, supplies and any other articles or materials used or capable of being used in connection with any of the foregoing. 3 To acquire by purchase, assignment, grant, license or otherwise, to apply for, secure, lease or in any manner obtain, to develop, hold, own, use, exploit, operate, enjoy and introduce, to sell, assign, lease, mortgage, pledge, grant licenses and rights of all kinds in respect of, or otherwise dispose of, and generally to deal in and with and turn to account for any or all purposes, either for itself or as nominee or agent for others: (1) Any and all inventions, devices, processes, discoveries and formulae, and improvements and modifications thereof and rights and interests therein; (2) Any and all letters patent or applications for letters patent of the United States of America or of any other country, state, locality or authority, and any and all rights, interests and privileges connected therewith or incidental or appertaining thereto. To manufacture, purchase, sell and generally trade and deal in and with any article, product or commodity produced as the result of or through the use of any such inventions, devices, processes, discoveries, formulae and improvements and modifications thereof, or the like, or any articles, products, commodities, supplies and materials used or suitable to be used in connection therewith or in any manner applicable or incidental thereto; to grant licenses, sub-licenses, rights, interests and privileges in respect of any of the foregoing, and to supervise or otherwise exercise such control over its licensees or grantees and the business conducted by them, as may be agreed upon in its contracts or agreements with such licensees or grantees for the protection of its rights and interest therein, and to secure to it the payment of agreed royalties or other considerations. To manufacture, purchase or otherwise acquire, invest in, own, mortgage, pledge, sell, assign and transfer or otherwise dispose of, trade, deal in and deal with goods, wares and merchandise and personal property of every class and description. To acquire, and pay for in cash, stock or bonds of this corporation or otherwise, the good will, rights, assets and property, and to undertake or assume the whole or any part of the obligations or liabilities of any person, firm, association or corporation. 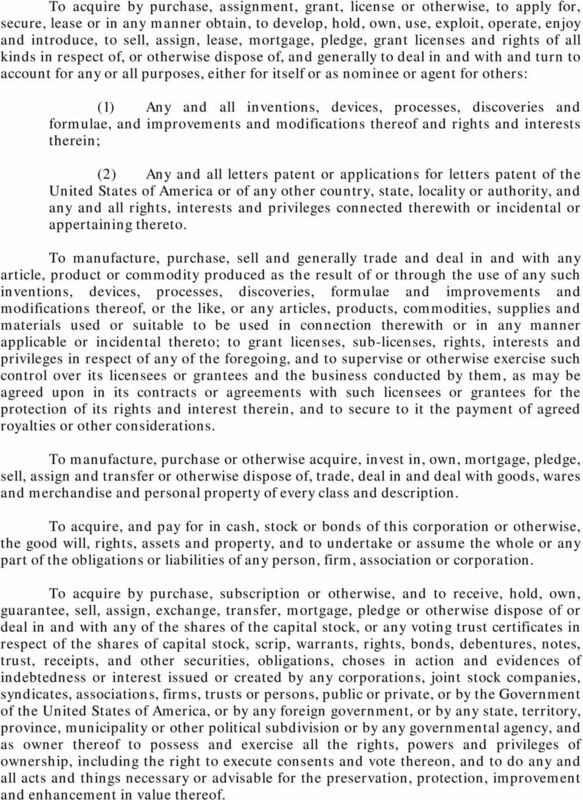 To acquire by purchase, subscription or otherwise, and to receive, hold, own, guarantee, sell, assign, exchange, transfer, mortgage, pledge or otherwise dispose of or deal in and with any of the shares of the capital stock, or any voting trust certificates in respect of the shares of capital stock, scrip, warrants, rights, bonds, debentures, notes, trust, receipts, and other securities, obligations, choses in action and evidences of indebtedness or interest issued or created by any corporations, joint stock companies, syndicates, associations, firms, trusts or persons, public or private, or by the Government of the United States of America, or by any foreign government, or by any state, territory, province, municipality or other political subdivision or by any governmental agency, and as owner thereof to possess and exercise all the rights, powers and privileges of ownership, including the right to execute consents and vote thereon, and to do any and all acts and things necessary or advisable for the preservation, protection, improvement and enhancement in value thereof. 4 To enter into, make and perform contracts of every kind and description with any person, firm, association, corporation, municipality, county, state, body politic or government or colony or dependency thereof. To borrow or raise monies for any of the purposes of the corporation and, from time to time without limit as to amount, to draw, make, accept, endorse, execute and issue promissory notes, drafts, bills of exchange, warrants, bonds, debentures and other negotiable or non-negotiable instruments and evidences of indebtedness, and to secure the payment of any thereof and of the interest thereon by mortgage upon or pledge, conveyance or assignment in trust of the whole or any part of the property of the corporation, whether at the time owned or thereafter acquired, and to sell, pledge or otherwise dispose of such bonds or other obligations of the corporation for its corporate purposes. To loan to any person, firm or corporation any of its surplus funds, either with or without security. 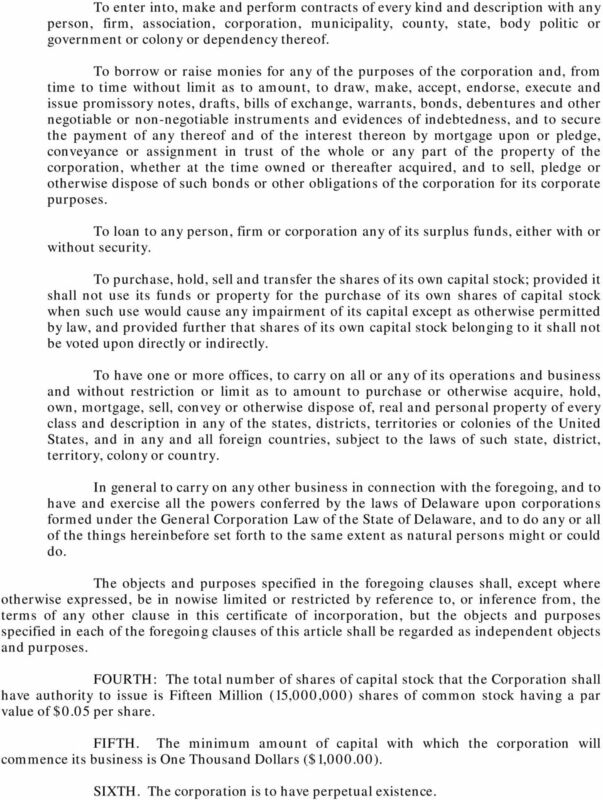 To purchase, hold, sell and transfer the shares of its own capital stock; provided it shall not use its funds or property for the purchase of its own shares of capital stock when such use would cause any impairment of its capital except as otherwise permitted by law, and provided further that shares of its own capital stock belonging to it shall not be voted upon directly or indirectly. To have one or more offices, to carry on all or any of its operations and business and without restriction or limit as to amount to purchase or otherwise acquire, hold, own, mortgage, sell, convey or otherwise dispose of, real and personal property of every class and description in any of the states, districts, territories or colonies of the United States, and in any and all foreign countries, subject to the laws of such state, district, territory, colony or country. 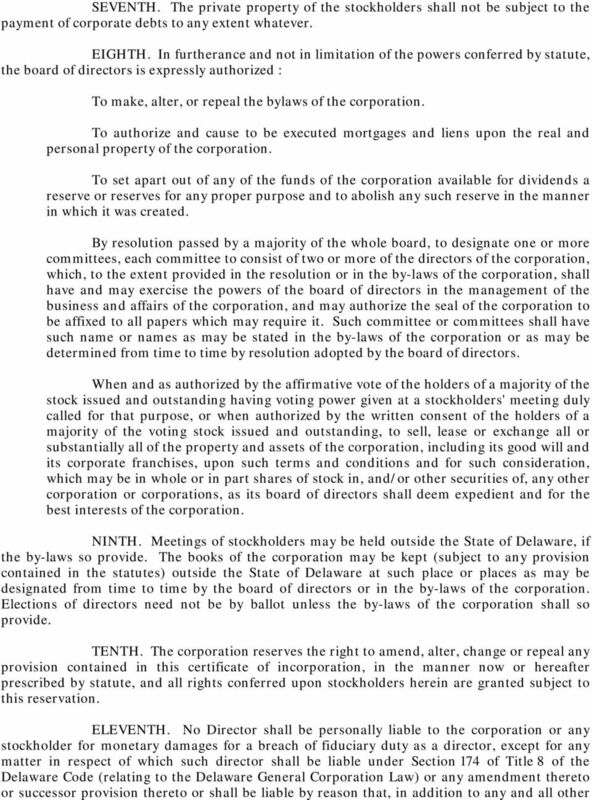 In general to carry on any other business in connection with the foregoing, and to have and exercise all the powers conferred by the laws of Delaware upon corporations formed under the General Corporation Law of the State of Delaware, and to do any or all of the things hereinbefore set forth to the same extent as natural persons might or could do. The objects and purposes specified in the foregoing clauses shall, except where otherwise expressed, be in nowise limited or restricted by reference to, or inference from, the terms of any other clause in this certificate of incorporation, but the objects and purposes specified in each of the foregoing clauses of this article shall be regarded as independent objects and purposes. FOURTH: The total number of shares of capital stock that the Corporation shall have authority to issue is Fifteen Million (15,000,000) shares of common stock having a par value of $0.05 per share. FIFTH. The minimum amount of capital with which the corporation will commence its business is One Thousand Dollars ($1,000.00). SIXTH. The corporation is to have perpetual existence. STATE OF TEXAS ARTICLES OF INCORPORATION FOR SOVEREIGN CENTRAL FUNDS CONTROL, INC. 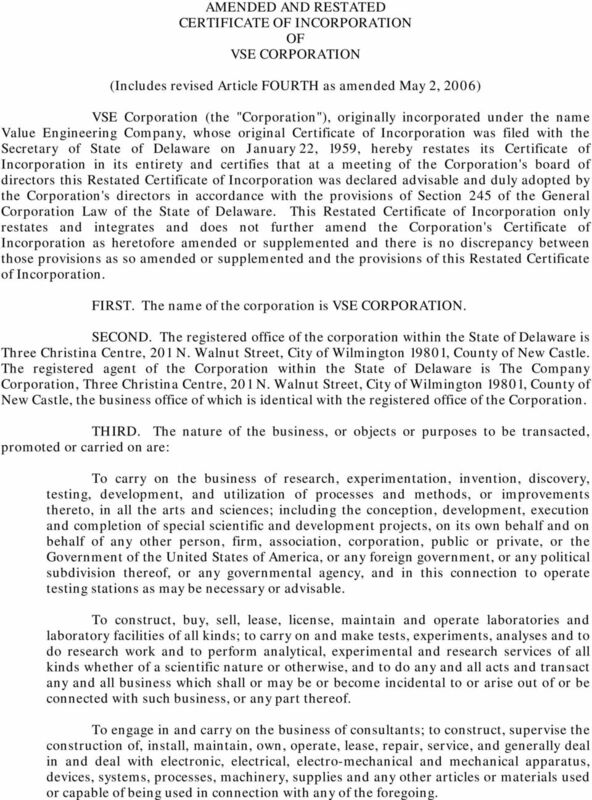 AMENDED AND RESTATED ARTICLES OF INCORPORATION OF COMPUTER SCIENCES CORPORATION. FIRST. The name of the corporation is Computer Sciences Corporation. CERTIFICATE OF AMENDMENT OF RESTATED CERTIFICATE OF INCORPORATION OF PFIZER INC.
CERTIFICIATE OF INCORPORATION BAY CROSSING HOMEOWNERS ASSOCIATION, INC.
C. R. BARD, INC. RESTATED CERTIFICATE OF INCORPORATION. FIRST: The name of the corporation is C. R. BARD, INC.